As Christmas fast approaches and Vapers everywhere have already sent off their letters to Santa Claus, our friends in China decided now would be a good time to throw us a curve ball. 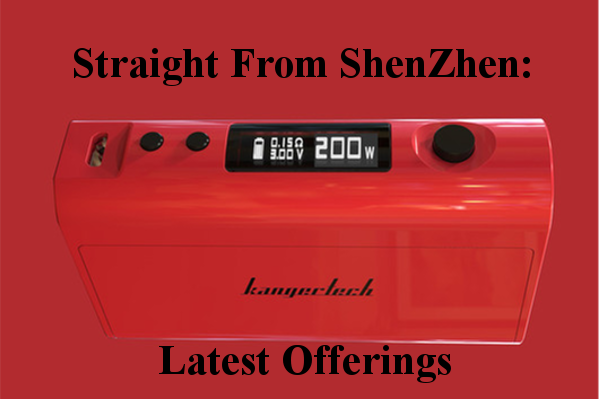 Today’s article, Straight from Shenzhen, KangerTech’s latest offerings have been revealed. While some of us couldn’t wait for the end of December to unwrap our new box mods, Kanger now has me wondering if these will be ready to put under my tree. Many of us have spent the last few months absolutely adoring the KangerTech “Box” series of mods. Whether our choice is the various Subox kits, all the way through to the Nebox, we have been left scratching our heads as the competition left Kanger in the dust as they all ran to higher wattage. It appears that the company was just sitting back and waiting for the right second to perform a perfect mic drop. The box itself looks remarkably familiar and KangerTech’s boasting that this will be the smallest 200 watt device currently available. We have grown accustomed to this company showing up fashionably late to the party, but we also know that when they walk in, they have a habit of changing the game. Although we still have limited information on this product, this will surely be one to watch out for as it hits the US market. This post will be updated with links on where you can purchase, when they become available. My personal pet peeve with any tank based system is the ritualistic method of refilling that everyone became accustomed to. I stopped using tanks because having to take it off my mod to fill it from the bottom was honestly a hassle. While the base unit of this device is a renamed and rebranded SUBOX nano, Kanger have changed it up and offered us a 3.2 ml top fill tank. Combine that with the 60 watts of power from the base unit ( or temperature control if you so choose) this little kit is everything you will need to get started as a vaper, except for the single 18650 battery that the device requires. The Subtank that Kanger released was a game changer for me personally, and its only down side has just been remedied. 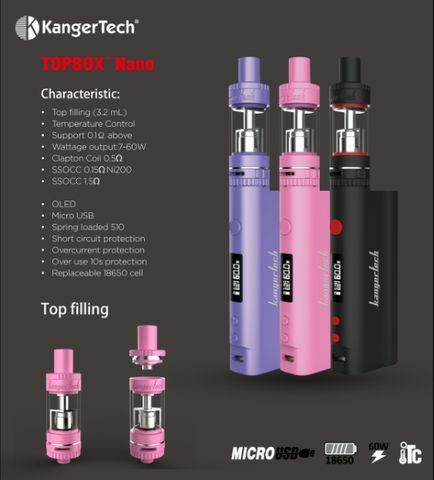 So, whether you are interested in mouth to lung hits or direct lung Sub Ohm vaping, the TOPBOX has you covered, the only thing you need to decide is purple, pink or black. 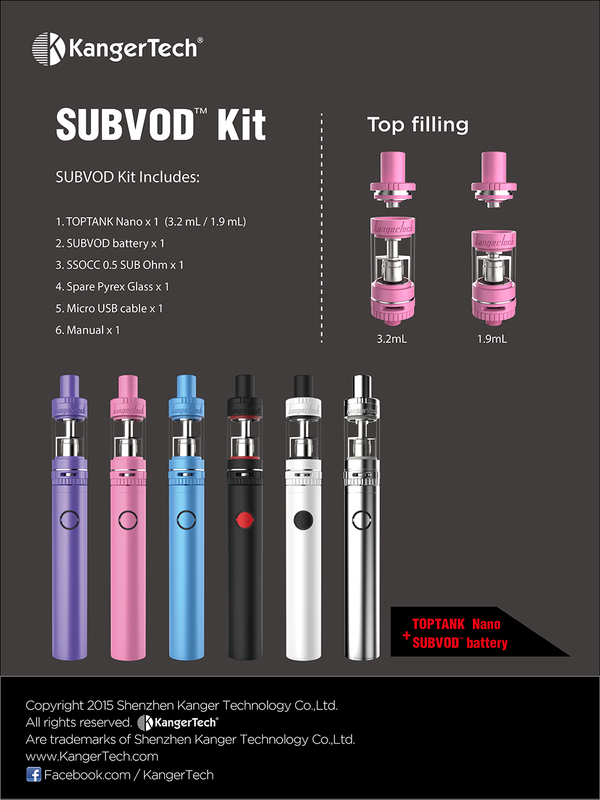 If you are looking for something small, sleek and simple to operate, the SubVod kit has you covered. This is definitely an introduction to Sub-Ohm vaping, no menu’s or setting to confuse anyone, it is as simple as using an eGo setup when you first start vaping. Utilizing the TopTank Nano, this 1300mAh device is perfect while you are on the go. With a 10-second cutoff timer, there is little possibility of accidentally firing in your pocket, and it is portable enough to be carried discreetly. With passthrough technology it can be used and charged simultaneously, making sure you always have the optimal vaping experience. It’s also available in 6 bold color choices, the question is… which one will you be taking home? 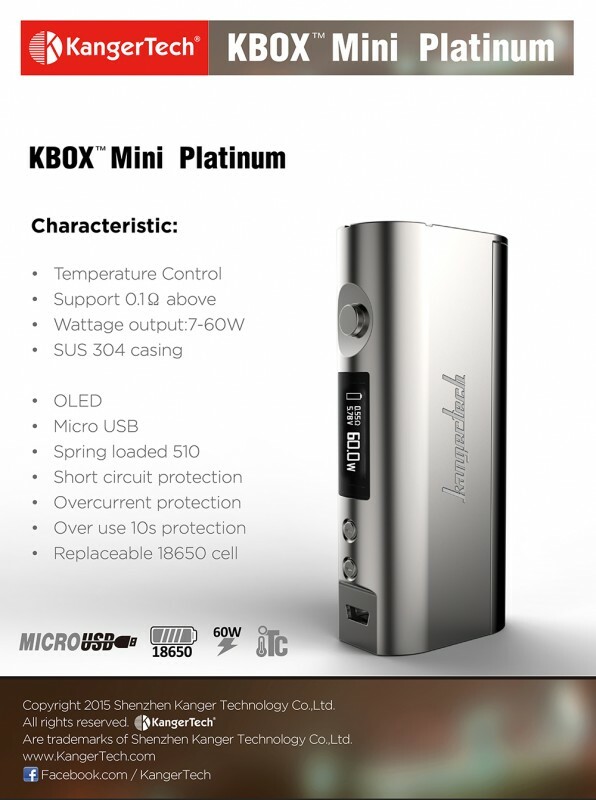 The all new Kbox Mini Platinum is an outstanding new device from Kanger that acts as a revision of the original Kbox Mini. Not only does this version offer you the high-end platinum appearance, but you’ll also receive quite the performance increase with this little as well. The Kbox Mini Platinum features the same SUS 304 casing, the magnetic battery cover, the OLED screen, micro-USB charging, spring-loaded center pin, a slew of safety features, as well as it holding a single 18650 battery. However, it also now offers temperature control and supports atomizer resistances as low as 0.1Ω. And, your mind will be at ease knowing this little guy packs quite a bit of power, right at 60 watts for an incredible vape. 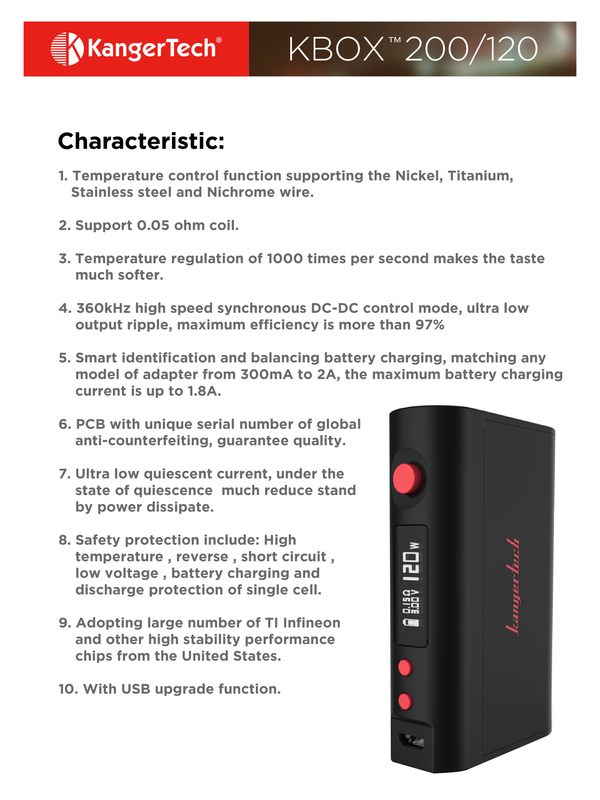 Whether you are a hard-core Sub Ohm vaper, or just starting out on your journey away from cigarettes, in all honesty KangerTech currently has all their bases covered. Each of these devices are simple to use and designed by a company whose name is trusted within the vaping industry. If you haven’t had the opportunity to try any of these devices, they should be on the list of future toys.